Have you ever wondered what would Antarctica look like if all its ice melted? This may seem extraordinary and unlikely, but, this has actually happened in the past. In fact, there have been no major ice sheets over the South Pole for most of the Earth’s history. In the video below, NASA Goddard strip away Antarctic ice to reveal a new, and much more detailed map of the bedrock below. This map, called Bedmap2, was compiled by the British Antarctic Survey and incorporates millions of new measurements, including substantial data sets from NASA’s ICESat satellite and an airborne mission called Operation IceBridge. Our understanding of what lies beneath the world’s biggest ice sheet has taken another leap forward. In this video we strip away Antarctic ice to reveal a new, and much more detailed map of the bedrock below. This map, called Bedmap2, was compiled by the British Antarctic Survey and incorporates millions of new measurements, including substantial data sets from NASA’s ICESat satellite and an airborne mission called Operation IceBridge. The video above is public domain and can be downloaded from NASA web site. Antarctica is the coldest continent. The coldest temperature ever recorded on Earth was -89.2 °C (-128 °F) on July 21, 1983 (during the Antarctic winter), at Antarctica’s Vostok station. 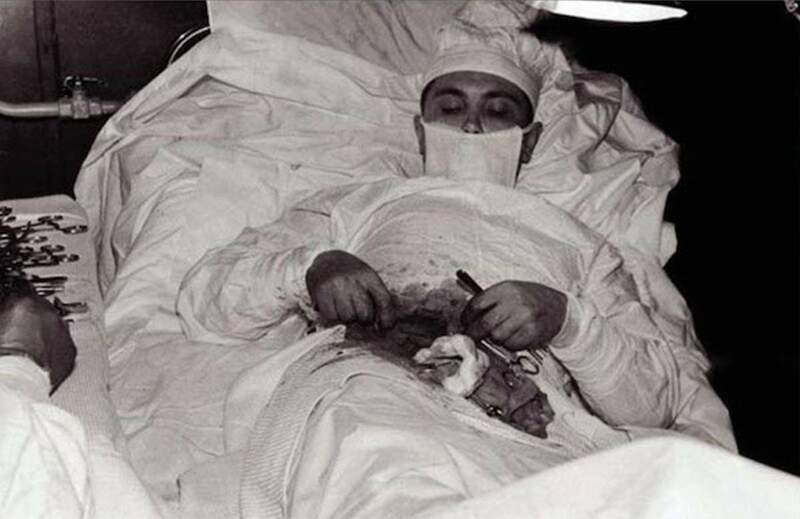 Why your appendix have to be removed, here is the story behind: the photo below, captured in 1961, documents probably the most famous appendectomy in the world, performed by Dr Leonid Rogozov (4 March 1934 – 21 September 2000), the Soviet general practitioner who took part in the sixth Soviet Antarctic Expedition in 1960-1961. He was stationed in Antarctica as the only doctor on the team, and couldn’t be evacuated when he developed appendicitis. He enlisted a meteorologist and a driver to hold tools and mirrors while he braved the procedure himself through waves of pain and nausea. But it went well, and Rogozov made a full recovery. 98% of Antarctica is covered by ice. With an average thickness of about 1 mile (1.6 kilometers), the Antarctic Ice Sheet is also the largest single mass of ice on Earth. But, unfortunately, due to the global warming, Antarctica lost about 125 gigatons of ice per year between 2002-2016, causing global sea level to rise by 0.35 millimeters per year. In the video below, data from the GRACE satellites show. Orange and red shades indicate areas that lost ice mass, while light blue shades indicate areas that gained ice mass. White indicates areas where there has been very little or no change in ice mass since 2002. In general, areas near the center of Antarctica experienced small amounts of positive or negative change, while the West Antarctic Ice Sheet experienced a significant ice mass loss (dark red) over the fourteen-year period. Floating ice shelves whose mass GRACE doesn’t measure are colored gray. If all the ice of Antarctica melted, ocean levels would rise about 60 meters (200 feet), drowning many coastal cities around the world. Antarctica is the windiest continent. 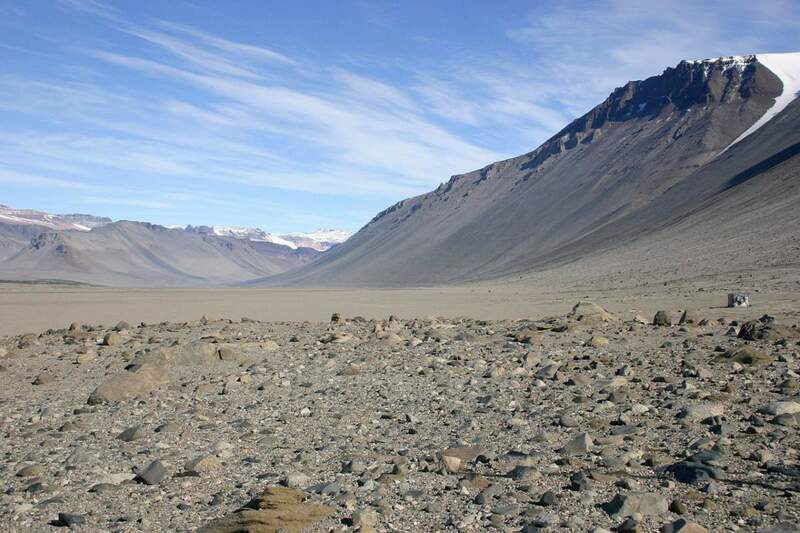 Winds in some place like McMurdo Dry Valleys can reach 320 km/h (200 mph). It also has the highest average elevation of all the continents: 8,200 ft (2500 m). Antarctica is the fifth largest continent. At 14,000,000 square kilometers (5,400,000 square miles), it is larger than Europe (10,180,000 km2/3,930,000 sq mi) and Australia (7,692,024 km2/2,969,907 sq mi). There are sand dunes in Antarctica. The largest recorded one was 70 meters (230 feet) high and more than 200 meters (650 feet) wide, and was located in the McMurdo Dry Valleys. Antarctica holds approximately 70% of all fresh water on Earth, and 90% of the planet’s freshwater ice. At 4,892 meters (16,050 ft) above sea level, Mount Vinson is the highest peak in Antarctica. At 3,500 km (2,200 mi), the Transantarctic Mountains which divide the continent into East and West sections is the fourth longest mountain range on Earth (the Andes is the longest at 7,000 km / 4,350 mi). The highest peak of this mountain range is Mount Kirkpatrick, with an elevation of 4,528 m (14,856 ft). The first expedition to reach the geographic South Pole was led by the Norwegian explorer Roald Amundsen. He and four others arrived at the pole on 14 December 1911, five weeks ahead of a British party led by Robert Falcon Scott as part of the Terra Nova Expedition. 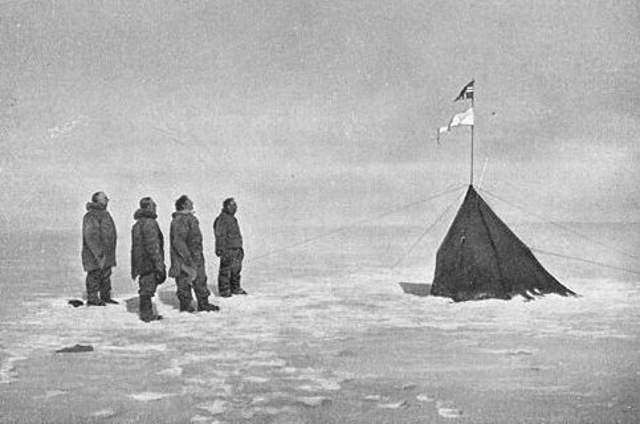 Roald Amundsen, Helmer Hanssen, Sverre Hassel and Oscar Wisting (l–r) at “Polheim”, the tent erected at the South Pole on 16 December 1911. The top flag is the Flag of Norway; the bottom is marked “Fram”, the name of the polar exploration ship. Photograph by Olav Bjaaland, one of the first five men to reach the South Pole as part of Amundsen’s South Pole expedition. There are about 400 known subglacial lakes in Antarctica, the biggest one being Lake Vostok. It is beneath Russia’s Vostok Station, which is at 3,488 m (11,444 ft) above mean sea level. The surface of this freshwater lake is approximately 4,000 m (13,100 ft) under the surface of the ice, which places it at approximately 500 m (1,600 ft) below sea level. Measuring 250 km (160 mi) long by 50 km (30 mi) wide at its widest point, and covering an area of 12,500 km2 (4,830 sq mi) and an average depth of 432 m (1,417 ft), it has an estimated volume of 5,400 km3 (1,300 cubic miles) – making it the sixth largest freshwater lake on Earth by volume (the largest lake on Earth is Lake Baikal). There is a giant trench under Antarctic ice which is deeper than Grand Canyon. It is up to 3 kilometers (1.9 miles) deep and more than 25 kilometers (15.5 miles) across. For comparison, the Grand Canyon is 1.8 kilometers (1.13 miles) deep at its deepest point. The floor of the subglacial valley is more than 6,500 feet (2,000 meters) below sea level at some points. There are also volcanos! Mount Sidley is the highest volcano, with a summit elevation of 4,181–4,285 meters (13,717–14,058 ft), and Mount Erebus is the second-highest volcano and the southernmost active volcano on Earth (last erupted in 2015). Most of the continent is completely dark during the region’s winter months (when summer in the northern hemisphere). But, During the summer months, the sun is constantly above the horizon. So, more sunlight reaches the surface at the South Pole than over a similar period of time at the equator. The male Emperor penguin is the only warm-blooded animal that remains on the Antarctic continent through the winter. Emperor penguin is the only penguin species that breeds during the Antarctic winter. The female lays a single egg, which is incubated by the male while the female returns to the sea to feed. The emperor penguin (Aptenodytes forsteri) is endemic to Antarctica. Reaching 130 cm (51 in) in height and weighing from 22 to 45 kg (49 to 99 lb), it is the tallest and heaviest of all living penguin species. The male and female emperor penguins are similar in plumage and size. Photo: Emperor penguin adults and a juvenile on Snow Hill Island, Antarctica (wikipedia). There are no polar bears living in Antarctica, they live in the Arctic. Antarctica’s soil has the lowest habitat diversity on Earth, since the continent is technically an icy desert, with extremely low temperatures, high solar radiation, and extreme dryness. There are relatively mild conditions on the Antarctic Peninsula and the subantarctic islands, which have warmer temperatures and more liquid water. So, the Peninsula and the islands are far more habitable, some areas of the peninsula can receive 900 millimeters (35.43 in) of precipitation a year, including rain, and the northern Peninsula is the only area on the mainland where temperatures are expected to go above 0 °C (32 °F) in summer. The subantarctic islands have a milder temperature and more water, and so are more favorable for life. There are no trees in Antarctica. Today, it is the largest desert on Earth. But, about 53 million years ago, during the early Eocene period, when Antarctic winter temperatures exceeded 10°C, while summers may have reached 25°C, palm trees grew on the continent. Today, Subantarctic flora is dominated by the coastal tussock grass, that can grow up to 2 meters (7 ft). Only two flowering plants inhabit continental Antarctica, the Antarctic hair grass (Deschampsia antarctica) and the Antarctic pearlwort (Colobanthus quitensis). Both are found only on the western edge of the Antarctic Peninsula and on two nearby island groups, the South Orkney Islands and the South Shetland Islands. Over 1000 fungi species have the on and around Antarctica. Antarctica (naturally) contains every timezone on the planet. The most saline water body in the world is the Don Juan Pond, located in the McMurdo Dry Valleys. Its volume is some 3,000 cubic meters but is constantly changing. It is claimed that Don Juan Pond is over 18 times the ocean’s salinity and 1.3 times that of the Dead Sea. Its high salinity prevents the Don Juan from freezing even when temperatures are below −50 °C (−58 °F). In fact, is the only one of the Antarctic hypersaline lakes that almost never freezes even during the winter months. The best meteorites are found in Antarctica. Meteorites fall everywhere on Earth with equal probability, but in Antarctica, they can be found easily (black rock on the white ice) and largely undisturbed by the natural processes. The Antarctic Meteorite Program is a cooperative agreement between three agencies: the National Science Foundation, NASA and the Smithsonian Institution – providing for the collection, curation, distribution, and long-term storage of meteorites recovered during annual U.S. expeditions to Antarctica. There is a blood red waterfall in Antarctica, named “Blood Falls”. It is an outflow of an iron oxide-tainted plume of saltwater, flowing from the tongue of Taylor Glacier onto the ice-covered surface of West Lake Bonney in the Taylor Valley of the McMurdo Dry Valleys in Victoria Land, East Antarctica. The Antarctic Treaty dedicates the continent to peaceful research activities. It was signed on December 1, 1959, after more than a year of secret negotiations by 12 countries. As of 2017, ‎there are 53 states party to the treaty. Today, nearly 30 countries operate more than 80 research stations around the continent. There are between around 1000 (during winter) – 4,000 (during summer) researchers in Antarctica. Apart from that, there are no indigenous populations. It is completely inhabited. Born in Fortín Sargento Cabral at the Esperanza Base, near the tip of the Antarctic Peninsula on 7 January 1978, Emilio Marcos Palma, an Argentine man, is known for being the first documented person born on the continent of Antarctica. Antarctica is also a tourist site. According to the International Association of Antarctica Tour Operators (IAATO), around 25,000-30,000 tourists visit the Antarctic Peninsula every year. There was a nuclear reactor in Antarctica from 1964 to 1972. It was a medium-sized, portable nuclear reactor installed at McMurdo Station, and was the first and only to operate on the Antarctic continent. It operated for 10 years and greatly reduced the need for fossil fuels in the Antarctic. But, during its operational lifetime, there was a total of 438 malfunctions. Because of being an unreliable source of power generation, available only 72% of the time, in May of 1972, it was determined and replaced with more reliable modern diesel-electric generators. There is a Fire Department on Antarctica, which is based at McMurdo Station. It is the only full-time professional fire department in Antarctica, and the largest and best equipped. The world’s southernmost bar is in Antarctica, at Vernadsky Research Base. Since 2002, Antarctica losing approximately 125 gigatons of ice per year, causing global sea level to rise by 0.35 millimeters per year. The mass of the Antarctic ice sheet has changed over the last several years. Research based on observations from NASA’s twin NASA/German Aerospace Center’s twin Gravity Recovery and Climate Experiment (GRACE) satellites indicates that between 2002 and 2016, Antarctica shed approximately 125 gigatons of ice per year, causing global sea level to rise by 0.35 millimeters per year. These images, created with GRACE data, show changes in Antarctic ice mass since 2002. Orange and red shades indicate areas that lost ice mass, while light blue shades indicate areas that gained ice mass. White indicates areas where there has been very little or no change in ice mass since 2002. In general, areas near the center of Antarctica experienced small amounts of positive or negative change, while the West Antarctic Ice Sheet experienced a significant ice mass loss (dark red) over the fourteen-year period. Floating ice shelves whose mass GRACE doesn’t measure are colored gray. In the Western world, belief in a Cold Land—a vast continent located in the far south of the globe to “balance” out the northern lands of Europe, Asia, and North Africa—had existed for centuries. For example, Aristotle had postulated a symmetry of the earth, which meant that there would be equally habitable lands south of the known world.